Published June 28, 2016, by Delacorte Press. Lada despises the Ottomans and bides her time, planning her vengeance for the day when she can return to Wallachia and claim her birthright. Radu longs only for a place where he feels safe. And when they meet Mehmed, the defiant and lonely son of the sultan, Radu feels that he’s made a true friend—and Lada wonders if she’s finally found someone worthy of her passion. Published September 27, 2016, by Scholastic Press. Fear the living more than the dead. It’s London 1888, and Jack the Ripper is terrorizing the people of the city. Evelyn, a young woman disfigured by her dangerous work in a matchstick factory, who has nowhere to go, does not know what to make of her new position as a maid to the Elephant Man in the London Hospital. Evelyn wants to be locked away from the world, like he is, shut in from the filth and dangers of the streets. But in Joseph Merrick, the Elephant Man, she finds a gentle kindred who does not recoil from her and who understands her pain. When the murders begin, however, Joseph and Evelyn are haunted nightly by the ghosts of the Ripper’s dead, setting Evelyn on a path to facing her fears and uncovering humanity’s worst nightmares. Reviews: A Hilarious Memoir, a Heartbreaking Historical Fiction, a Surprising Murder Mystery, and an Addictive Assassin Fantasy! 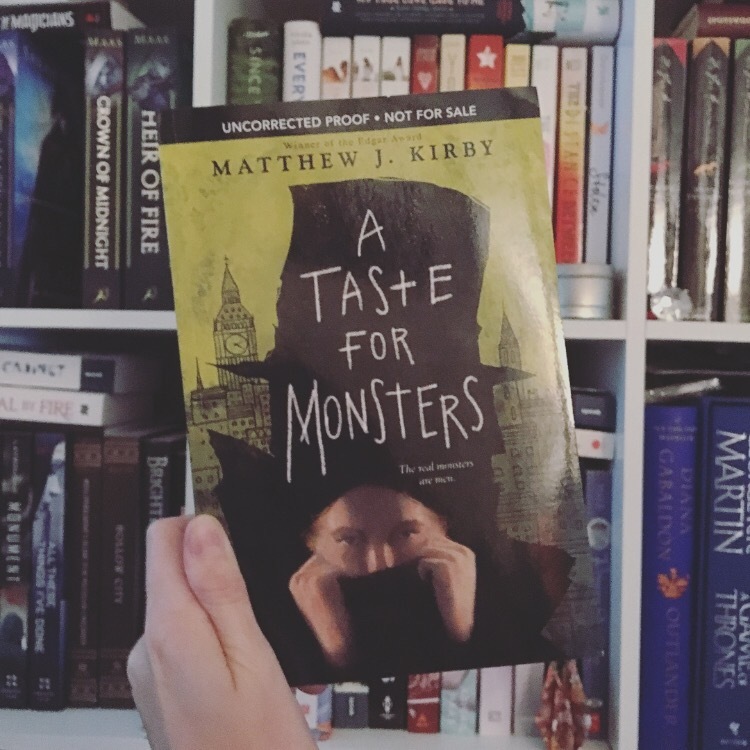 As promised, here I am with some reviews of some recently (and not-so-recently) read titles! I haven’t written a review in such a long time, so let’s hope I remember how! Also, instead of including all of the book info in the post, I’m going to link to Goodreads for this one, don’t hate me. Special thanks to St. Martin’s for providing me with a copy of the book for review! Reading a whole lot like fiction, this memoir is a book that I’m so glad I took a chance on. Rae’s writing on her teen life is so relatable, fun, and utterly hilarious. Any fan of YA contemporary will immediately fall in love with Rae and her story, so don’t let the fact that it’s a memoir scare you away! I really can’t picture anyone not enjoying this book. Wow, what an incredible story. This was my first time reading Ruta Sepetys, and I was blown away. Her storytelling is beautiful and heartbreaking. She took me on a journey of survival, love, loss and hardship following a group of individuals whose stories history often neglects to tell. I’m an avid reader of historical fiction , particularly about the second World War, and this book did not disappoint. I can’t wait to read the companion, Between Shades of Gray. Special thanks to Penguin Random House for providing me with a copy of the book for review! I went into this looking for an intense mystery or thriller, but what I got was so much more. Tina is the definition of a badass female heroine. She’s extremely stubborn, fierce, and can’t be controlled. But among these somewhat common elements of YA are unique and interesting focuses on Africa’s poverty, refugees, and warfare that I’d never read about before. I really enjoyed this book and it was a super quick read! The concept of a kiss that kills is nothing new, but the addition of the Indian folklore was an element that kept the book from being more of the same. It kept my interest but I still had some problems with the ease of resolution to some major events. The ending felt more like an epilogue than a final chapter, but I’m still very excited to see what the second installment brings! As I mentioned above, it’s been a while since I’ve written reviews, so these were rough. But I hope that you enjoyed it, and will check out some of these lovely titles! The missing girl is Jewish. I need you to find her before the Nazis do. Amsterdam, 1943. Hanneke spends her days procuring and delivering sought-after black market goods to paying customers, her nights hiding the true nature of her work from her concerned parents, and every waking moment mourning her boyfriend, who was killed on the Dutch front lines when the Germans invaded. She likes to think of her illegal work as a small act of rebellion. On a routine delivery, a client asks Hanneke for help. Expecting to hear that Mrs. Janssen wants meat or kerosene, Hanneke is shocked by the older woman’s frantic plea to find a person–a Jewish teenager Mrs. Janssen had been hiding, who has vanished without a trace from a secret room. Hanneke initially wants nothing to do with such dangerous work, but is ultimately drawn into a web of mysteries and stunning revelations that lead her into the heart of the resistance, open her eyes to the horrors of the Nazi war machine, and compel her to take desperate action. Meticulously researched, intricately plotted, and beautifully written, Girl in the Blue Coat is an extraordinary, gripping novel from a bright new voice in historical fiction. Special thanks to The Novl for providing me with an advance copy of the book for review! 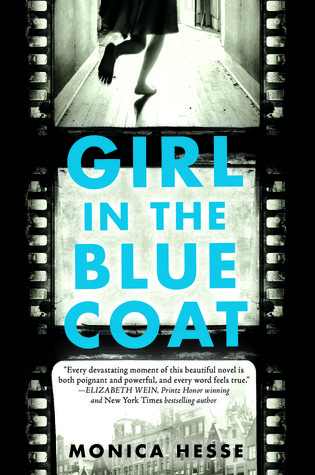 Girl in the Blue Coat is a truly unforgettable and utterly incredible story that will stay with you long after you’ve finished reading it. It’s a heartbreaking look at not only the impact of the horrors of the Nazis on Jews, but also on those who joined the resistance, or resisted on their own. It shines a light on the little known stories of the fighters in the Netherlands, and the underground resistance groups that did as much as they could to help others survive the war. The moment this book popped up on my radar, I knew I had to read it. I’ve always been fascinated by WWII, and this book seemed like it would share yet another perspective that I’d never read from before. I learned so much that I never knew. The workings of the resistance groups were amazing, and the ways in which people rebelled against the Nazis in any way they could was extremely touching. Reading the author’s note on historical accuracy at the end of the book was even more illuminating. Trust me when I say that this story was so well researched, accurate, and beautifully written. It’s really a story about love, friendship, and bravery. There are passages where Hanneke reflects back on a past romance, and lost friendship that she is trying to cope with while the main story is going on. Because of those past memories, I got a good sense of what shaped Hanneke to be a wary fighter, and what she was like before the war affected her life. I found this book to be unique in it’s focus on how the war and cruelty affected everyone, not just Jews. The friendships that were created for Hanneke from being thrust into her quest to find Mirjam, the missing Jewish girl, showed–dare I say it– a positive side to the war. But it also showed how the war tore people apart. The story was fast paced, but lacked no emotion for want of more excitement. The book left me in awe for many reasons, but the build up to the end had a lot to do with it. I could tell that the way the story unfolded was clearly intricately planned out, and hints at the truth were dropped throughout the story — we just didn’t know it yet. I was very surprised at the complexity of the revelation. I was definitely not expecting the story to play out the way it did. But as I said before, none of the serious and extremely important issues were sacrificed for the fictional story. I won’t be forgetting any of these characters any time soon. Girl in the Blue Coat was a stunning and heart-wrenching story showing a unique perspective on WWII, and the way it affected the lives of everyone during the time period. If you are interested in WWII books, or historical fiction, Girl in the Blue Coat should be at the top of your TBR! Psst! I wrote a guest post on Ely’s blog as a part of a WWII blog event a little while ago sharing the 5 reasons why I was SO EXCITED to read this book. If my review hasn’t convinced you, go check that out! And be sure to check out the other posts from other amazing bloggers to find more WWII titles to add to your TBR! 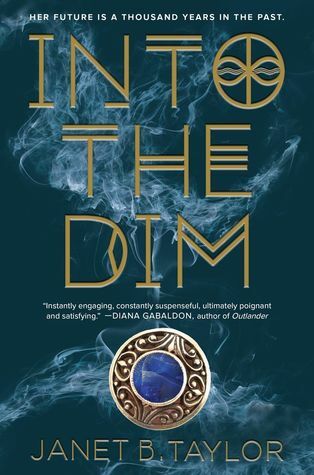 Addictive, romantic, and rich with historical detail, Into the Dim is an Outlander for teens. Special thanks to HMH BYR for providing me with an advance copy of the book for review! All quotes are taken from the ARC and are subject to change with the final printing. Into the Dim had been so hyped up for me, I was a bit nervous that it wasn’t going to live up to that hype, and in turn my high expectations. But man was everyone singing it praises spot on! It had everything I could ever want in a book, and was written beautifully. Everyone in town knew the coffin was empty. That’s a pretty amazing first line! The beginning did start off a bit slow, but once it picked up, it didn’t stop. The characters were also a bunch of fun! Hope was a relatable character, although I haven’t been through many of the same things. There was just something about her that made you like her, feel for her, and root for her to succeed. Her actions, and reactions, to the crazy situations she was thrown into made the story seem that much more real. Phoebe and Collum were two others that I absolutely loved! Phoebe was so bubbly and fun, the polar opposite of her brother Collum who was strict, serious, and loyal. The friendship that formed between Phoebe and Hope was sweet, and even Hope’s relationship with Collum was a banter-y, but adorable one. I also loved the historical characters: sweet little Rachel, wise Sister Hectane, and strong Queen Eleanor of Aquitaine. There’s also Bran, who I quite liked. He’s cocky and confident, but with a brooding, dark side. What’s not to love?! The one character that I didn’t like was, unfortunately, Sarah, Hope’s mother. Her actions and conversations with Hope didn’t seem natural. I mean, come on Sarah, your daughter just travelled through time to save you and you don’t really help her out that much… But we don’t get to see too much of her in this book, so maybe we’ll get some more mother/daughter love in the next book. And yes of course, there’s romance. I hate to say it, but I wasn’t a huge fan. The introduction is hinted at very early on, and it’s a common thought in Hope’s head ever after that. I really, really loved how Hope actually rationalizes with herself when she catches herself thinking about a boy instead of her mom after learning about the whole time travel thing. It’s not often you see that in YA. The romance did grow on me throughout the book, though. The more information you learn about Hope’s past, the more it makes sense. I just felt like it developed a bit too fast to seem realistic. She was also a little naive at points, when concerning said love interest. This was the only thing that kept me from giving Into the Dim a full five star rating! But here’s the real reason I couldn’t completely jump on board with the whole romance: I ship Hope with someone else! There will be minor spoilers ahead, highlight to read! I shipped Hope with Collum so hard!! And I thought that maybe there would be a love triangle because I caught some subtle hints that Collum was developing feelings for Hope. But, alas, not in the first book at least. Maybe it was more a brotherly protection vibe I was getting? But the way he is so loyal in protecting her, and warning her about falling for Bran… I don’t know, maybe it was just me. Spoilers are over now! Romance aside, Into the Dim is a fantastic read. It’s filled with excitement, tons of detail, and a story like none other! Wonderfully written, no small detail is left out. It’s clear tons of research went into crafting this incredible and magical story. I cannot wait to read the second book! The ending provided some closure, but there is a lot more I want to learn about in this world! It’s Been a Year…but I’m working at Penguin Random House?! 2018 Releases! They’re right around the corner! What a cute little bookstore! Definitely a magical shop full to the brim with lots of bookish treasures. This blog is my hobby, and I do not receive compensation for any posts or reviews I write. Sometimes I receive ARCs for free from publishers or authors in exchange for an honest review. All reviews are my own thoughts and opinions, non-biased, and not at all influenced by authors or publishers, including promotional blog tour reviews. Book covers and synopses are taken from Goodreads.com unless otherwise noted. If you have a problem with anything featured on this site please, please, PLEASE feel free to contact me! None right now! Check back soon! 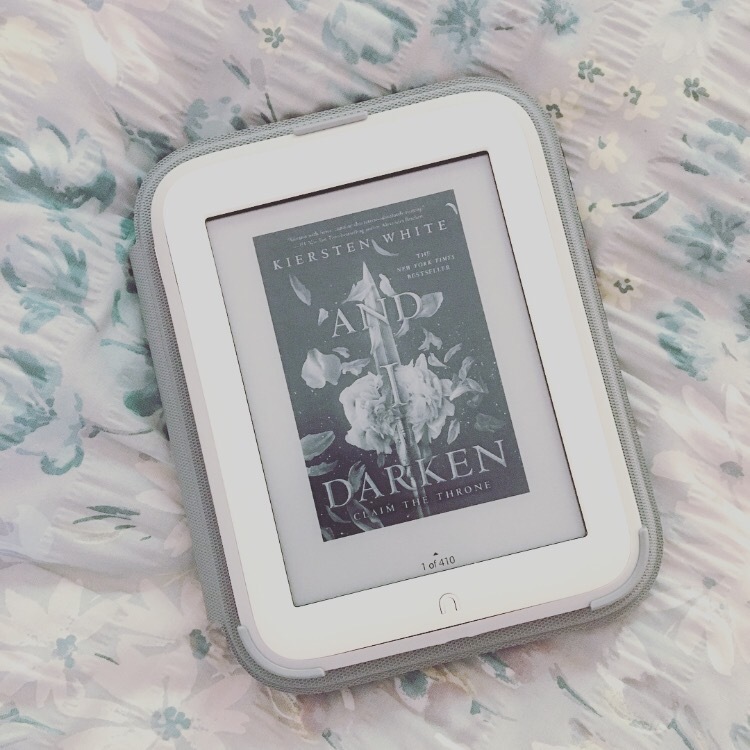 Book Photography & Blogging | The Rise of Bookstagram & Do Photos Make for Better Posts? Some of you may not know that beyond a reader, I’m also a graphic design student! Check out my portfolio of work!